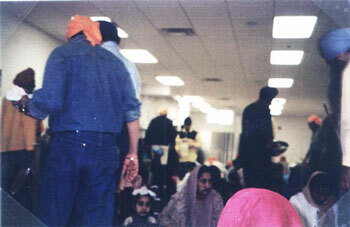 On March 10, 2002 I went to attend services at the LaSalle Gurdwara in Montreal. I went with three classmates, two of whom, Raj and Gurinder, were born into Sikh families. I feel that I must note my indebtedness to Raj and Gurinder for their assistance in translating the spoken Punjabi that day, and for providing a bit of background on the services that I attended, as without their explanations, I would have been lost in the Gurdwara, and this research paper would never have been done. The Kirtan, or hymn singing is performed by the Kirtani-Jathas at the LaSalle Gurdwara. The Kirtani-Jathas are professional singers, and are sometimes also called Ragi-Jathas. There are two types of Kirtani-Jathas that perform at LaSalle-temporary and permanent ones. 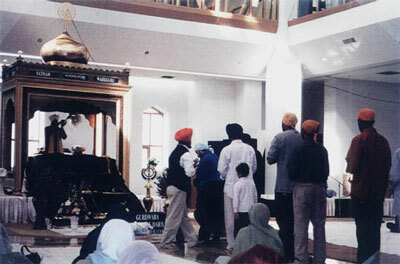 The temporary singers are usually from India or Toronto, and they pass through the Gurdwara in their travels. 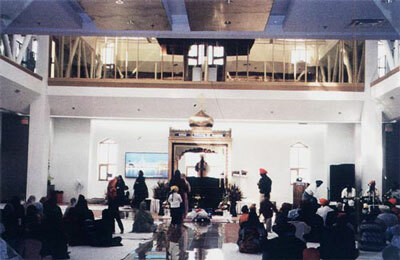 The temporary Kirtani-Jathas live in the Gurdwara during their stay while they perform the Kirtan. The permanent Kirtani-Jathas are generally local Sikhs who have been taught to sing the Kirtan. Anyone who sings the Kirtan must be baptized in the Sikh religion, although children from ages five through twenty-one perform occasionally on Sundays, and they do not need to be baptized. The Kirtani-Jathas perform in groups of three, with one playing the tabla, or drum, and the two others playing harmoniums. The Guru Granth Sahib, or the Sikh Scripture, is read by two members of the LaSalle congregation called Granthis, who are baptized into the Sikh community. The Granthis usually also perform the Ardas, or final group prayer, although any baptized person can perform it during the services. At the Gurmat camp, the children perform the Ardas, and as they are children still, they do not need to be baptized to perform it. The translators of the Guru Granth Sahib are called the Katha-Bachaks, and they summarize the section of the Guru Granth that was sung by the Kirtani-Jathas. The Guru Granth Sahib itself is fanned in the Gurdwara by a volunteer so as to keep the dust off of it. The fan used is called the Chaur, and its waving also shows respect to the Guru Granth Sahib as the presiding Guru of the Gurdwara. The Parshad, or holy sweet is distributed by any volunteer at the LaSalle Gurdwara. It is not necessary that a person be baptized into the congregation to distribute it. The services that I attended were very moving, and I particularly liked that one did not need to simply sit and listen to the Kirtan, but could move around during the services to an extent. The services seemed very conducive to just doing as you please- as you could sit in silence and meditate on the Kirtan, or you could softly speak to others under the sound of the Kirtan being sung. Still, everyone in the prayer hall appeared to be very involved in listening, and I thought it was very interesting to just look at people's faces as they listened to the Kirtan being performed, as it seemed to strike each person very differently. The LaSalle Gurdwara main prayer hall is eighty feet by one hundred feet in size, and fits more than one thousand people inside of it. It is quite a cavernous hall-much larger than I would have expected it to be. The altar was set at the opposite end of the hall from the doorway, and was probably ten feet by eight feet in size. 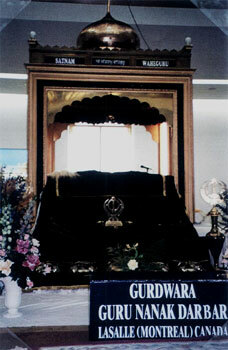 The altar was of course raised up from the ground, with the Guru Granth Sahib on it under a canopy. There was a red piece of fabric on the end of the Guru Granth that was towards the congregation, and the fabric looked to be velvet, although I must say that I did not want to get too close to the altar for fear of disrupting the services. On the side of the canopy there was a decoration in the form of the Sikh Symbol, or the Kanda, which is a circle with a sword attached to it. As well on the altar were flowers arranged out of respect for the Guru Granth Sahib. The seating arrangements for the congregation consisted of a series of cloths placed on top of carpeting in the main prayer hall. The congregation sits on the mats, with the men on the right side of the hall and the women on the left side. I sat with the women, as I was with three women, and would have felt a bit out of place and confused had I sat by myself on the men's side. Upon entering the hall, I was struck by how many people there were in attendance, and by the activity in the hall. As the singing of the Kirtan was constant, and was amplified so that all could hear it, the children of the congregation were constantly running around, yelling and playing, and some even walked around fixing the cloths on the ground so that they were all straight and even. The children mostly sat with their mothers, although some did sit with their fathers on the men's side. I noticed that many of the congregation sat along the walls, presumably to rest their backs against it, rather than sitting upright for so many hours on end. As well, there was a constant flow of people coming in to pay their respects to the Guru Granth Sahib and to make an offering of money for the Gurdwara's upkeep, adding to the movement in the prayer hall. The one main impression I came away with from the prayer hall was just how active it all was. Although I am not Christian, I have been to church a few times, and I always felt that the silence and stillness was rather oppressive (at least to me personally), so the activity of the children and the constant entering and leaving of the congregation in the Gurdwara seemed very new to me, but quite appealing at the same time. Upon entering the building, I was told to go in the right doorway, take off my shoes, wash my hands, and cover my head with a bandana, all things somewhat new to me, but things that I understood the significance of from class. The facility itself is very new, having been opened on December 24,2000, and has grown in its congregation very rapidly. As I traveled to the Gurdwara, I was not sure I would find it, but luckily for me, I saw some Sikh men on their way to the Gurdwara, so I went with them. I had thought the Gurdwara would be some humble little building with only a few congregation members there, but as I rounded a corner, suddenly the building was not only visible, but also quite imposing. From the outside, the facility is quite large in appearance, a fact only amplified by the fact that the Gurdwara is painted in bright white, so that it shone in the sunshine and looked simply massive. I personally liked the fact that there was a very tall flagpole next to the Gurdwara flying the Sikh flag-I felt that the flag marked the Gurdwara as a place of refuge from the world, which seemed to be a quite appropriate observation after viewing the proceedings of the services. All in all, the LaSalle facility was just extremely elegant-it seemed to be a labour of love created by a conscientious and caring congregation that was concerned with honouring their God and staying true to their religious vows. The Langar was located in the downstairs area of the LaSalle Gurdwara, and when I entered it, I noticed how large it was-it appeared as though it could hold about three or four hundred people in it. The seating arrangements consisted of mats on the ground arranged so that you would sit on the edge of one mat with your back towards another person on the opposite edge of the mat. The mats were about three feet wide, so there was not very much room on them when another person was sitting on the opposite side from you. The LaSalle facility segregated the women and the men in the Langar as well as the prayer hall, which we found out the hard way, as a man sitting nearby told Gurinder and Raj in Punjabi that they could not sit on the men's side, which we made the mistake of doing at first. It is allowed that families sit together in the Langar, as the segregation rules are not as strict there as in the prayer hall, but we did not see any families eating together while we were there. 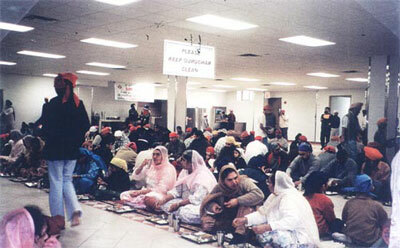 The process of getting food in the Langar was that you go stand in line to get a plastic tray with a number of different sections on it to separate your food, and you take utensils and napkins and go sit down. After sitting down with an empty plate, I noticed that I was almost mauled by people willing to serve me food-they walked about the Langar with buckets or trays of various foods, such as rotis, dhal, a delicious rice pudding, and a number of other foods that I was not as familiar with. These servers would walk down the rows of seated congregation members just offering food to everyone. The food was all vegetarian, I was told, and was very good, although I know that I am a bit biased, as I love Indian food in general, which cannot be said for many North Americans. In any case, I took too many rotis and they filled me up very quickly, so that I left a bit of food uneaten on my plate, which I felt bad about as I was quite obviously an outsider and guest at the Gurdwara, and I felt it was disrespectful not to finish all that was given me. As for the cooking and cleaning of the Langar, all of the jobs were performed by volunteers from the congregation, including cleaning the dishes, the kitchen, and the Langar hall itself. As for the cooking, the only requirement was that one be trained or knowledgeable in the method of cooking Punjabi food, so that anyone from the congregation could theoretically perform that job as well. The kitchen area was a particular point of pride for the congregation members, as when we took a tour of it, the man who showed us the kitchen kept pointing out the stainless steel walls (to keep them from getting bacteria on them), the brand new stoves and ovens, and the very modern fire-control system built into the kitchen around the stovetops. The congregation members volunteer their time to perform certain duties, and a member of the congregation called a Sewadar makes a schedule of volunteer times. The Sewadar's function is to make sure that the Langar and kitchen are properly cleaned and taken care of, and as mentioned, they make up the schedule of volunteering. The congregation members are strongly encouraged to volunteer but are not required to, in the spirit of the Sikh work ethic. The food storage room in the kitchen was very well stocked, with all of the food being provided by the congregation in the form of donations. The napkins, paper towels, cleaning supplies and general items like those are purchased using money gained from donations to the Gurdwara, and the Sewadars take care of those functions as well in the LaSalle Gurdwara. From visiting the Langar and kitchen, I was struck by how plentiful the amount of food was there, considering that a Sikh is not supposed to eat more than what he needs to survive. I could have sat and eaten for the entire day and it would have been okay with the congregation members. There were a couple of homeless men who came into the Langar for a free meal, and they seemed to be regulars, as they had bandanas on and had their shoes off, and seemed to be perfectly comfortable in the Langar. I thought that this was a touching example of the warmth of the Sikh community in accepting others who are unlike themselves, and inviting them in to eat in their Langar until they are full without making any sort of value judgement of them. I thought that the Langar was a fascinating place, and I saw that the talk of Sikh "equality" was not just talk, but a reality, as all shared the mats on the floor, and ate the same food. The LaSalle Gurdwara offers Punjabi language classes for children ages five through twenty-one, and they happen weekly on Friday, Saturday and Sunday. The classes are taught mostly by women who have come directly over from India, some of whom are volunteers, and some of whom are paid by the Gurdwara. There are also religious classes offered, in which one can learn to sing the Kirtan, which is taught by the Ragi-Jathas. There are also classes taught in which one learns Gurbani, or what is written in the Guru Granth Sahib, and how to read it properly. The Gurdwara encourages its younger members to learn of the Sikh religion through these classes, and they are important for the future of the Gurdwara, in that the classes create a future generation of people to subscribe to the Sikh religion. Altar Arrangements of "Gurdwara Duru Nanak Darbar"
If there was one somewhat negative part to my visit to the LaSalle Gurdwara, it was that the women and men were so segregated from each other from the moment they entered the Gurdwara. I understand the reasoning behind separating the men and women when they come to religious services, but I simply figured that as the Sikh religion was so markedly progressive in other areas, it would be in its treatment of men and women. I realized in our experience in the Langar of sitting in the wrong section that it was not so much that men could not sit on the women's side, but more that the women are not allowed to sit on the men's side, which could possibly be refuges of past Indian culture. Needless to say, I was somewhat disappointed by discovering this segregation of the sexes. Overall though, I felt that my experience at the LaSalle Gurdwara was a very positive one, as I was exposed to a completely different culture that I would never have seen had I not gone to the Gurdwara. I think the Sikh religion is a fascinating one, and I have much respect for it after taking this Introduction to Sikhism course and seeing its teachings in practice in the LaSalle Gurdwara.